I'm not a very good documenter, an issue which makes blogging difficult. I forget to take pictures. b. I remembered to take pictures before the workshop was over. The picture above is everybody after 4 hours of adventure. John is taking his finished sampler off the loom, Cheryl and Dennis are watching, Dawn is reading a Saori book (probably not actually reading as it's in Japanese) and Susan is finishing up for the day. 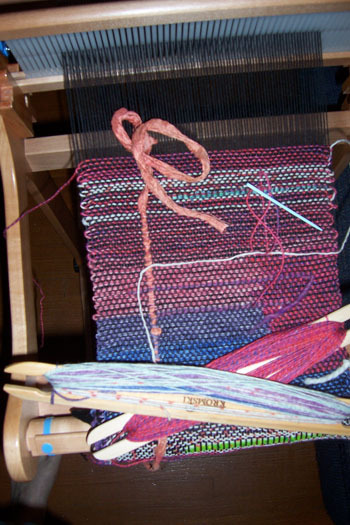 The workshop focused on two techniques and permutations thereof: inlay and clasped weft with 2 and 3 yarns. It was planned to be an intermediate workshop, with previous experience on rigid heddle required. Participants were to come with a loom, warped and ready to weave. On registration, everyone was provided with 400 yards of black cotton 8/4 carpet warp, and instructions to create a 9' warp about 9" wide. Oh the rebellion! Cheryl and Susan weren't experienced rigid heddle weavers and had little weaving experience. (They are, however, fiber people and great knitters, and adventurous, and I am not such a stickler for rules, even my own.) John offered to come in before the workshop and help them warp borrowed looms. So, they were essentially weaving for the first time in a Saori-inspired way. It was so rewarding to work with Cheryl. She was using a 20" loom, and was having to navigate the learning curve of using it. Adding in clasped weft, juggling two and then three weft yarns going at the same time - well, that's a whole lot to encounter for first time weaving, and I very much admired her for plunging in and exploring the process. And not throwing up her hands, even when she chose mohair to work with at one point! Though it doesn't quite show up in the photograph, there was a tremendous amount of motion expressed in the beginning part of Susan's weaving. It was very lively and lovely to see. Dawn is an experienced rigid heddle weaver. I'm not sure I've seen anyone take off the way she did. For weeks after her first class, every time I saw her in Riverwools, she had a new scarf or wrap to share. Since she was trying lots of different yarns, I got to enjoy seeing (and feeling) how they worked up. Two things are interesting about her work yesterday -one, her choice to use white as her sampler base color. It was a practical thought she had, so that things would show up better. I don't think she realized how amazing it would look. The other interesting thing is that weaving freestyle is out of her comfort zone. You'd not know it to see how she enthusiastically engaged and created some visually striking work. John is a master weaver - he is actually my weaving teacher. 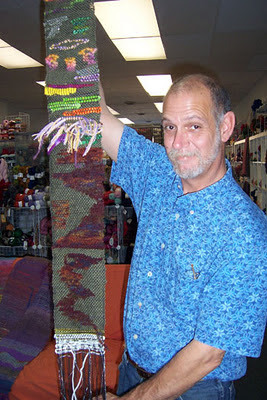 I learn to tri-loom weave from him and he is also the one who started me on rigid heddle. So it was a great thrill to be able to share some weaving fun with him. He has one of the Saori principles deeply in his heart: weaving as a group, the sharing of weaving with others. It was very generous of him to help Cheryl and Susan to be able to take the class, and he has been more than generous with me over the years, sharing his knowledge and weaving wisdom, booth space and lots of laughter. This is my post-workshop weaving. My own weaving in the workshop was demonstrative, and done more to show the techniques. 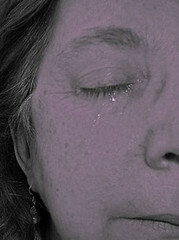 But I was certainly inspired by all the discovery of the day and came home and continued to weave. I'm using up some Opal sock yarn here. If fibery clutter is evidence of a good time, we had a great time. I learned some new things, found inspiration from my students. And Susan and Cheryl bought looms. The weaving looks really interesting. If I wasn't already full of blogging, quilting with the printing waiting in the wings, I would be tempted to take it up. This was a great class... and YES, way outside my comfort zone. It's good to step out once in a while and I confess, the ideas are simmering in the back of my head. THANK YOU for your patience, inspiration and support!